Long before Litespeed was a bicycle company, it was functioning as a high end custom machine shop specializing in exotic metals. What was then called Southeast Machine created anything from items as simple as nuts and bolts for local companies to items as exotic as underground tanks for liquid gun powder for government agencies, and pretty much anything in between. Southeast Machine was a family run business, and in addition to mom and dad, 3 sons and a daughter were also part of the company. The elder sons were fairly active runners. When the oldest son suffered a running injury, he was told that he needed to ride bikes instead. As that son went to a local bike shop he found himself not too impressed with the selection and thought that he might be able to build a bike from the titanium material they had in the shop. After playing around in the evenings and on a couple weekends the brothers had created a frame and eventually took it to a local bike shop to get a fork for it. The guys at the local bike shop kind of mocked them a bit about their attempt to build bikes themselves, but that did not deter them. Eventually word of mouth got out and several regional athletes asked about the bikes and slowly the weekends at Southeast Machine were busy with crafting bike frames. 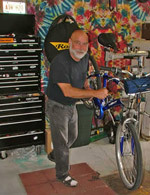 News by now had traveled across the country and several high profile athletes were inquiring about the bikes. In 1986 the family was encouraged to show off a couple of their creations at the Long Beach, CA bike show and eventually they traveled with a few frames on their back to California. While they were at the show, someone made them aware that another company was also exhibiting titanium bikes, but at the opposite end of the hall. That company was called Kestrel, but eventually ended up being called Merlin as the name Kestrel had been already been taken by another company. The response at the Long Beach show was phenomenal for the family and it was now time to name the bike company. "It is light and it is fast, how about Litespeed?" was one of the suggestions that really stuck, but eventually it was decided to spell it Litespeed. Litespeed quickly got a great reputation as a very experienced titanium manufacturer, and before too long Litespeed was creating frames for many notable brands within the bike industry, including but not limited to: DeRosa, Merckx, Tommassini, Basso, Univega, Alpinestars, Marin and Rocky Mountain. This work actually helped Litespeed in more than one way as basically some of the greatest minds in cycling were sharing their bike design philosophies with Litespeed and all the folks at Litespeed soaked up all that information like sponges. Before too long, bicycle frames and components were the main business of Litespeed and outsource work was less and less accepted. Litespeed was now touted as the world leader in cycling technology, and to this day Litespeed has been pushing the envelope of cycling technology development.